What is Blue light filter? 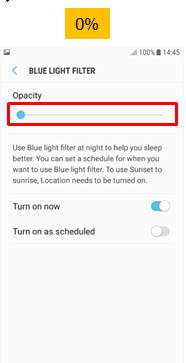 The blue light filter will decrease the amount of blue light displayed by the device’s screen. Reduction of blue light will prevent suppression of melatonin production (sleep-inducing hormone), which in term help users sleep better. How to set Blue light filter? How to install or remove memory card in Samsung Mobile Device?